Easter Bunny box with logo. Product: 1 x filled chocolate. Size: 40mm x 40mm x 132mm. Contents: Dark chocolate with advocaat, mint or cherry filling. Delivery time: 2-3 weeks as standard, please advise us as soon as possable if needed sooner and we'll try and work something out. 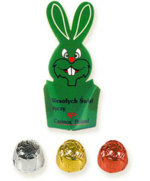 Other promotional and personalised items besides our Easter Bunny box with logo Click here. Each one of our Easter Bunny box with logo comes with your company details and business logo printed on to make sure that you stay ahead of your competitors by advertising your company details. To find out more about our Easter Bunny box with logo click here and fill in the contact form and we'll get straight back to you. So advertise your business on our Easter Bunny box with logo today!